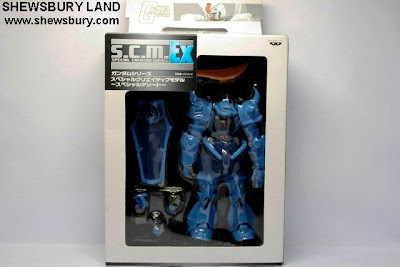 This is the Special Creative Model Ex: Gouf produced by Banpresto - Bandai's very own child specializing in other stuff that is not done by Bandai but surely it helps a lot to contribute some income to Bandai as a group. Received these items since last week but I was busy watching the DVD of my favorite TV Shows - Boston Legal.... the final season (5) - it was dramatic as it is fun and I hope they will make some spin off or something out of it. I personally like the concept and the story a lot. It is basically at 1/144 scale. Proportion wise, I would say it may not be 100% accurate or perfect but for the price you pay and for all the fun that you get from this item, I couldn't be bothered, I think it is quite great, not perfect but great, we in Shewsbury Land are quite happy with it. As for the details on the shield, we are quite happy with it. Some simple panel lining and it looks good. I tried as much as possible not to put too many photos in this review so I guess these should be enough... You know what it can do, if you like them or if you want to know further, go grab them, they're quite cheap. Overall, this is a very fun toys or figure to have and to play with and also looks good for a display item, at such a cheap price of 1,450 yen (about SGD 23.00) before adding the shipment charges, I think this item worth every single cents you spent on it. Additionally, you can read the review of the Zaku II in this link.